Palestinians took to the streets across the West Bank and Israel to commemorate Land Day this weekend, in protest of ongoing Israeli confiscation of Palestinian land through settlement expansion and the construction of the separation wall. Land Day marks the anniversary of the killing of six demonstrators by the Israeli security forces in 1976. Palestinian citizens of Israel held demonstrations across the country to protest the expropriation of their lands by the Israeli government. Israeli forces fired on unarmed demonstrators in the town of Sakhnin. Rallies marking the killings spread from the interior of Israel to the occupied territories. "The land issue is the same, whether in the West Bank, Israel, Jerusalem, or Gaza," said Samer Jaber, who organized a 400 person demonstration in the town of Al-Khadr, near Bethlehem, where he says the Israeli separation wall will result in the de facto annexation of 90% of the town's land. "It's the same situation: annexation through changing the identity and demography of the land [through settlement]. We need a new identity based on living together," he added. Al-Khadr held its Land Day march on Friday, beginning with a Muslim prayer service on the road leading to the construction site of the Israeli wall, and then marching to a barbed wire roadblock set up by Israeli soldiers to block the demonstration. According to the Palestinian Central Bureau of Statistics (PCBS), more than 475,000 Israelis live in settlements built on occupied Palestinian land in the West Bank and Jerusalem. Israeli settlers' councils control 42% of West Bank land, not including Jerusalem, which is home to the bulk of the settlers. The Israeli separation wall has resulted in the confiscation of 47,900 dunams (one dunam is 1,000 square meters) of Palestinian land, and the isolation of 301,100 more dunams between the wall and the Green Line, where 44,273, PCBS reports. Israeli soldiers denied access to a member of Israeli Knesset, Dov Hanin from the left-wing Hadash party, who attempted to travel to Al-Khadr to join the demonstration. "I arrived on Friday morning at the Israeli military checkpoint near Al-Khadr . I received an invitation from the popular committee in the town, yet I was surprised that when I told the troops I was a Knesset member, they refused to let me in," Hanin said in a statement. He added, "What I faced on Friday morning is part of the circumstances in the Palestinian territories which I know pretty well, and this enhances my belief that ending occupation is inevitable." In the village of Al-Ma'sara, south of the Bethlehem, Palestinians demonstrated against the construction of the separation wall on the village's land. The Popular Committee for resisting the wall told Ma'an that Israeli troops attacked demonstrators with clubs and rifle butts, injuring at least four people. The main Land Day march was held in the city of Jaffa, on the Israeli coast, on Saturday. 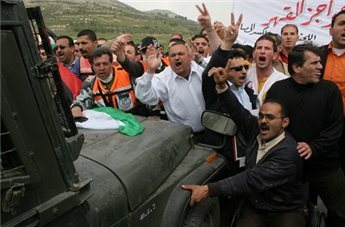 Protests were also held in unrecognized Bedouin villages in the Negev desert. In the city of Nablus Israeli forces dispersed a demonstration at Huwwara checkpoint at noon using tear gas and sonic bombs. Huwwara, which separates Nablus from nearby Ramallah, is known as one of the most constricting West Bank checkpoints, subjecting Palestinian travelers to long and sometimes humiliating searches. Israeli soldiers forcibly blocked the protesters from reaching the checkpoint. The soldiers detained a student named Alaa' Deriyya and another young Palestinian man who could not be identified. Deriyya remains in custody while the other was released shortly after arrest. 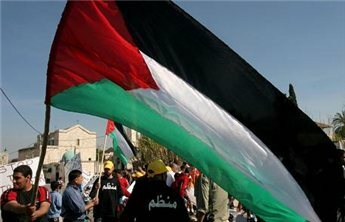 Demonstrators raised posters with slogans calling for Palestinian unity and for the removal of Israeli military checkpoints. Dalal Salamah, head of the union of Palestinian women, told Ma'an's Nablus correspondent that the rally is a form peaceful resistance aimed at pressuring Israel to dismantle the checkpoints. Several Palestinian civil society organizations sponsored the rally. TOMORROW WILL BE the 31st anniversary of the first "Day of the Land" - one of the defining events in the history of Israel. On the 31st anniversary of the Day of the Land, with the 60th Independence Day approaching, it is time to take this bull by the horns.